LEAPING INTO THE END ZONE - Pearland all-purpose athlete Austin Landry (10) leaps through a hole for a 4-yard touchdown to give the Oilers a 14-0 lead against George Ranch. Pearland beat the Longhorns 28-7 to complete the 2018 regular season with a perfect 10-0 mark. Landry also scored on a 2-yard run. 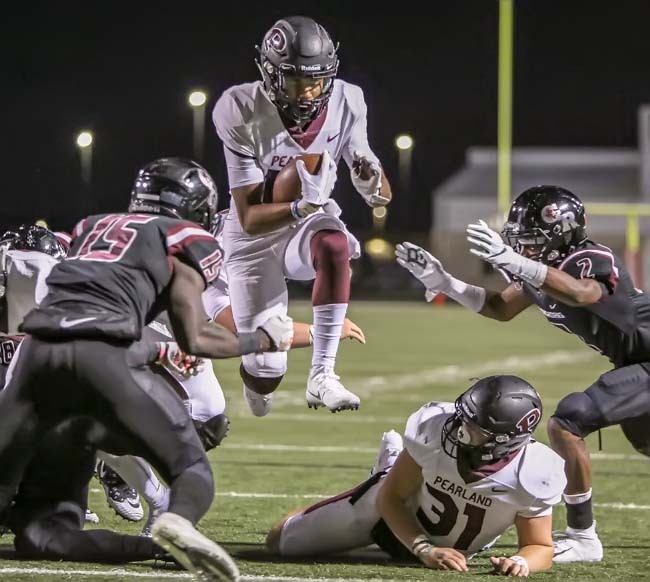 PEARLAND — For the eighth time in Pearland football history, the Oilers have finished the regular season with a 10-0 mark. The years that Pearland closed out a regular season without a loss included 1950, 1962, 2001, 2005, 2008, 2010, 2015, and now 2018. This has also been a great way to begin the Ricky Tullos legacy as the first-year coach of the Oilers. Tullos has been the head coach of two other schools that have posted 10-0 marks before the start of the playoffs. Tullos led Cleveland and George Ranch (twice) to perfect regular season records with his 2015 George Ranch squad winning the Class 5A Div. I state championship. So he knows how to get to the big dance at AT&T Stadium in Arlington. 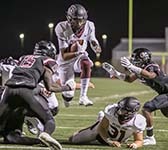 The unique game between Pearland and George Ranch was that Tullos was on the other side of the field in last year's contest as the head coach for the Longhorns. Things turned placing the former head coach with the task of beating his former players. With the one game at a time focus, the Oilers did what they needed to do to capture sole possession of the 23-6A championship with the 28-7 win and give Tullos a perfect 10-0 mark for the regular season. The score actually could have been worse as several long touchdowns were called back due to various penalties. The Oilers scored once in each quarter and that was all they needed. Record-setting quarterback J.D. Head scored Pearland's first touchdown on an 18-yard scramble for a 7-0 lead following the PAT by Caleb Mendez. The Oilers drove to the Longhorn 4-yard line in the second period and all-purpose athlete Austin Landry did the rest with a 4-yard leap into the end zone to make the score 14-0 following the Mendez PAT. George Ranch managed to keep the game close as they scored before intermission giving Pearland a slim 14-7 edge. In the third quarter, Head lofted a beautiful 33-yard pass to the end zone that was snagged by Jaden Piece for another touchdown. Mendez booted the PAT for a 21-7 advantage. The scoring pass by Head gave him another PHS passing record as he broke the single-season touchdown passing mark of 24 that was formerly held by All-State quarterback Trey Anderson. Head now has 25 for the 2018 season with at least another game for this year. Head set new single-game passing marks in the third game of the year when he threw for 357 yards against Cinco Ranch to break the former mark of 314 yards by Anderson plus he set the single-game touchdown passing mark in the same game with six scoring strikes breaking the former record of four by a couple of Pearland signal-callers. Landry placed the final points on the board in the final frame with a 2-yard scoring plunge and the 28-7 final score was set following the Mendez PAT. Head was right on target as hit 20-of-24 passing for 282 yards and one score. The field general enters the playoffs with 2,324 yards passing and 25 touchdowns. Freshman running back Torrance Burgess had nine carries for 80 yards to lead the ground attack. Senior running back Jaelin Benefield has 1,276 yards on the ground with 15 touchdowns and the speedster will be looked upon to be a difference-maker in the drive to a state championship. Malcolm Linton was the game's top receiver with seven catches for 164 yards with a couple of TD passes called back. Piece had three grabs for 56 yards and a TD while Landry caught two for 27 yards. The Oilers will host the Dickinson Gators (8-2) on Friday, November 16 at The Rig at 7:00 p.m. in the Class 6A Div. I Region III bi-district contest.